Marianne Pease – President (NoVA Guild) started cosplaying in college thirteen years ago when she coerced her roommate to sew a Witch Hunter Robin dress for her. She went on to sell blood plasma twice a week so she could afford her first sewing machine. By the time ICG founder Marty Gear swept her up in her first Balticon masquerade and she joined the GCFCG, she was absolutely in love. Since then she has served in my local guilds here and there. She is currently the Treasurer of the NoVA chapter. She has watched the enormous explosion in popularity that cosplay and costuming has received, and the vast numbers of people fall in love with costuming just like she did. While not all convention goers are costumers, there is clearly a lot of room to grow. Her primary goal is to reach out to the rising generations of costumers and cosplayers and offer them the same home and sense of community among the ICG that she found. Mera Babineaux – Vice President (Silicon Web Costumers Guild) is half of the creative duo behind Shimmer and Shade Family Cosplay and Prop House 42 Productions. She is a makeup artist, has been actively costuming since high school theater where she was the costume mistress for 3 years, and also build sets and props. She inadvertently entered the Con community through the DragonCon Masquerade in 1996, and has been very involved ever since. In addition to attending conventions, judging costume contests and running panels, she has also been a board member, Director of Costuming and Con Design, and general member at large for several east coast conventions, most recently serving on the Mysticon Board and as their costuming director and Masquerade maven. Her passion is for education and outreach with children and teens and she actively volunteer in my community to promote sensory friendly costuming, disability friendly costuming, anti-bullying efforts, after school programs, and social and life skill building through costuming and cosplaying. Jeanine Swick – Treasurer (Silicon Web Costumers’ Guild) is ICG Treasurer and former SiW Secretary. Her grandmothers and mother taught her to make clothes for dolls and school at an early age. In Home-Ec, she made 3 piece suits while others figured out 3 piece patterns. She costumed in high school for theater, and later for her own teens. Her work is “period inspired” rather than historically accurate, incorporating her own creativity. She sells at regional renfaires, cons, SCA, and belly dance events. 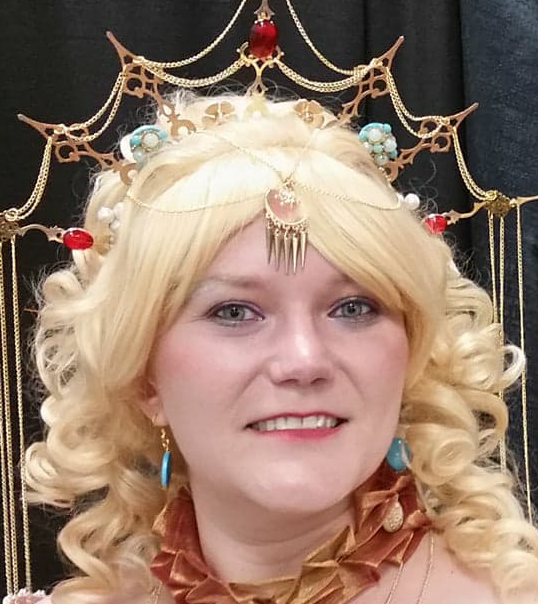 Visit Designs by J.
Vicky Assarattanakul – Corresponding Secretary (Madison Area Costuming Society) has been sewing since she was 5 years old and joined the world of convention costuming in 2005. She is a lover of beads and rhinestones, and does media recreations, historical recreations, and original designs. Her most recent endeavors have taken her into the world of fashion and she is currently designing her own line. She is also Editor of the ICG International Costumer newsletter. Anne Davenport – Recording Secretary (Silicon Web Costumers’ Guild) has been costuming for 40 years since sewing and wearing a Starfleet uniform for Senior Class Dress-up Day in high school. Most of her costuming energies are aimed at convention hall costuming, but she also participates in Masquerades at the Master level from Costume-Cons to Worldcons. Relevant fan experience: editing a very tiny SF club newsletter and serving on a couple of fan club boards in the 1990’s. She is currently helping the Rebel Legion (a Star Wars costuming group) revise their club charter, which currently has significant organizational difficulties. She now looks forward to doing some good for the ICG, which she has been a member of for at least twice as long as she has been with the Rebel Legion.